Recorded: Meimaktgelande Mannheim, Germany June 21st. 1986. Sound: Excellent stereo soundboard recording. FM radio broadcast. 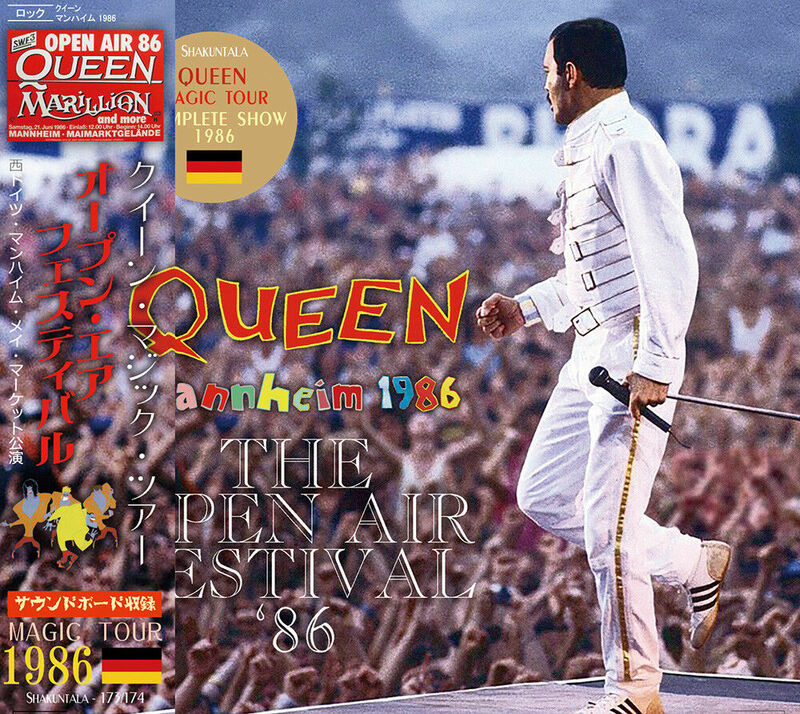 Comments: Well, another Queen 2cd bootleg from the Mannheim concert. This was a rock festival, which also included other well know band. Queen was the headliner, and ended the day. The hole festival was by what I know, radio broadcasted in its entirety. This Japanese 'Shakuntala' 2cd release looks like a nice bootleg. This concert has been previously released on a handful of cd bootlegs, as well on vinyl. 'We Are The Champion' was filmed, and shown on television, as a part of a report of the day. But, I have no confirmed information, that more was filmed. Other band that they was Craaft, Level 42, Gary Moore & Marillion. Roots: Well, originally from a radio broadcast. It was a tour after releasing the album "KIND OF MAGIC", which eventually resulted in the final tour of the original member. What is included in this work is the beginning of the tour on June 21, 1986 in Mannheim. It appeared as a part of the festival on this day, and it is fully recorded with a high-quality sound board over the full story. It is a sound board sound source from the magic tour which took place on the largest scale in Queen history. Permanent preservation of a beautiful picture / disk specification A tightly pressed board. Japanese-style attaching.